These are excellent choices! Americans are giving a collective ‘thanks’ becasue we have an intelligent, deep thinking President! Yeah! President-elect Barack Obama and Vice President-elect Joe Biden officially announced key members of their economic team today, naming Timothy Geithner as Secretary of the Treasury and Lawrence Summers as Director of the National Economic Council. Obama and Biden also named Christina Romer as Chair of the Council of Economic advisors, and named Melody Barnes and Heather Higginbottom to serve as Director and Deputy Director of the Domestic Policy Council. “Vice President-elect Biden and I have assembled an economic team with the vision and expertise to stabilize our economy, create jobs, and get America back on track. Even as we face great economic challenges, we know that great opportunity is at hand — if we act swiftly and boldly. That’s the mission our economic team will take on,” said President-elect Obama. Timothy Geithner currently serves as president and CEO of the Federal Reserve Bank of New York, where he has played a key role in formulating the nation’s monetary policy. He joined the Department of the Treasury in 1988 and has served three presidents. From 1999 to 2001, he served as Under Secretary of the Treasury for International Affairs. Following that post he served as director of the Policy Development and Review Department at the International Monetary Fund until 2003. Geithner is a graduate of Dartmouth College and the Johns Hopkins School of Advanced International Studies. Lawrence Summers is currently the Charles W. Eliot University Professor at Harvard University. Summers served as 71st Secretary of the Treasury from 1999 to 2001 and as president of Harvard from 2001 to 2006. Before being appointed Secretary, Summers served as Deputy and Under Secretary of the Treasury and as the World Bank’s top economist. Summers has taught economics at Harvard and MIT, and is a recipient of the John Bates Clark Medal, awarded to the American economist under 40 judged to have made the most significant contribution to economics. 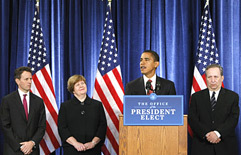 Summers played a key advisory role during the 2008 presidential campaign. Christina Romer is the Class of 1957 Professor of Economics at the University of California, Berkeley, where she has taught and researched since 1988. Prior to joining the faculty at Berkeley, Romer was an assistant professor of economics and public affairs at Princeton University’s Woodrow Wilson School of Public and International Affairs. Romer is co-director of the Program in Monetary Economics at the National Bureau of Economic Research and has been a visiting scholar at the Board of Governors of the Federal Reserve System. Melody Barnes is co-director of the Agency Review Working Group for the Obama-Biden Transition Team, and served as the Senior Domestic Policy Advisor to Obama for America. Barnes previously served as Executive Vice President for Policy at the Center for American Progress and as chief counsel to Senator Edward M. Kennedy on the Senate Judiciary Committee from December 1995 until March 2003. Heather Higginbottom served as Policy Director for Obama for America, overseeing all aspects of policy development. From 1999 to 2007, Higginbottom served as Senator John Kerry’s Legislative Director. She also served as the Deputy National Policy Director for the Kerry-Edwards Presidential Campaign for the primary and general elections. After the 2004 election, Higginbottom founded and served as Executive Director of the American Security Project, a national security think tank. She started her career as an advocate at the national non-profit organization Communities in Schools.